53 out of 53 (100.00%) customers would recommend this product to a friend. We have been ordering for a few years and have been satisfied. Fits well. Good color...great pricing...will order again. This was great...especially after paying $30 for something very similar at a retail store. The remanufactured cartridges work awesome...just as good as the OEM brands. These worked great. We had no problems with them and the color seemed the same as HP. No doubt off-brand ink cartridges are inferior to the brand name, but that's a decision the consumer should be allowed to make. HP has tried everything to keep me from using non-HP ink & it looks like they've finally met their match... Thank you! I go through color ink pretty fast during August/September, December, and April/May! These were just what I needed to complete my projects and not break the bank! I've been ordering my toners from this company over the past 8 years or so. Whenever I place an order it's delivered within 2 to 3 days, which is commendable. I would recommend this company's toners to anyone that has an HP because the retail price for HP ink is very expensive. I have buying from Ink Technologies for a few years now, and it's the only ink company I use. The quality is equal to manufacturer direct, and the price is unbeatable. I definitely recommend them. Not to mention quick delivery. The price and quality is very good. My printer recognizes the ink and I have very little loss. I can't say enough about Ink Technologies. They are up front with you if they don't have something. They troubleshoot with you on printing issues as best as they can. They stand behind their products. I chose this rating because the ink is of high quality and we were very pleased with the timeliness of shipment. I would recommend this product to all of my coworkers. The price was great and the quality was the same. Why pay more when you can get the same quality for less. I like my HP printer scanner but it uses ink way too fast. This is a much more affordable alternative to name brand products and works great. I love this company. Good value, good performance, fast shipping. I am very pleased with this purchase. It performs as promised. I would recommend it to everyone. The price and quality on this product is what my small business needed. Shipping was also very fast! Great product at a great price. Delivered quickly too. Great price. The quality of this ink is as good as higher priced ink. I recommend this buy. Easy to order and put into computer, it prints well. I have used these ink cartridges for a number of years. They are terrific. I can't justify buying the HP cartridges from Sams Club for $70 for 2 when I get these for so much less and they work just as good. Great product with great savings. Great value for dollar. Be careful when removing the tab to avoid leak. Only had one that did this out of all of the cartridges I ordered. I bought a whole set of cartridges for this printer. I am getting great quality prints with near perfect color representation. This is good ink for the price... a much better value than OEM, and it works well with my printer. Excellent value and good product. Worked like original. I have been using InkTechnologies for more than 5 years now and their service and product is far superior to any other company. High quality and cost effective. I've been using this product with my HP Deskjet 3520 for over 2 years and have never had any problems. Highly recommend. Every bit as good as the HP Product unlike others I've bought elsewhere. Though I've had a few problems customer service helped me through and they work just fine after doing as they say. I might have to do it a couple of times but the price is worth the effort. Doesn't happen on all of them just some. I'm satisfied. Good product for the price; great price for the product. I give all catagories a star rating because the cartridges are all working great with my printer and the price beats the HP price at a great savings. I would recommend this product to everyone that likes to save money and get good quality ink supplies for their printers. This remanufactured cartridge fit my printer well, locked in place and delivered great printing. I have ordered these from various companies, but have found the quality and price to be very good, and would order again. No problems with product or service. Price is excellent. Super replacement cartridge for a super low price. Works great. I ordered the required remanufactured HP ink cartridges for my husband's HP photo printer/copier. They arrived promptly, & worked without a hitch! The price was so unbelievable, I thought there would be something amiss, but this is not the case. We were happy to send our used up cartridges back for recycling, & to keep the cycle going. We will always order our printer cartridges & toners from InkTechnologies from now on! This ink is great, it lasts just as long as the name brand, and looks just as good too. Best product for its value. Print quality excellent and price is lowest I have found. The color does well on my pictures and lasts a long time. It has been long lasting, and an excellent product. Easy to install and get all the printing done that I need. Works fine, and is cheaper than the HP original. We print lots of papers and graphics in this house for school projects, as well as 4x6 photos. The quality is great, and the value is even greater! Excellent product and no technical problems. Great value. These products are as good if not better than the original HP. good product at a good price. I am really impressed. Great product at a great price. I would recommend! Never had a problem with these cartridges. Works great with my printer. Good price. I was slightly skeptical when i read about alternative ink for my HP printer. I was considering buying another printer given how costly the original HP ink is. But this ink works perfectly well and I am very happy with all my orders. The installation is very easy as well - I had absolutely no problem. Highly recommended! It's just like original and higher yield. Product Quality is good and price is low. An instructional video demonstrating replacement of a 564XL Cyan ink cartridge, which replaces the original OEM HP cartridge. The new remanufactured 564XL Cyan ink cartridge is a more affordable alternative to the OEM supply, but still offers a comparable yield of up to 750 pages, estimated based on 5% page coverage. Color coding helps avoid mistakes during installation, and its compact size makes it very simple to install. Begin by preparing your 564XL Cyan cartridge for installation. Remove it from its box, and also remove it from the bag. Find the packing tape at the top of the cartridge and pull firmly to remove it, then pry the cartridge away from the orange plastic to remove that as well. With the printer powered on, lift up on the access cover. The carriage containing the cartridges will move to the center for better access. Find the empty HP 564XL Cyan cartridge and look for the small lever at its front. Press backward on the lever, then lift the cartridge out of the printer. With the 564XL Cyan ink cartridge at a slight downward angle, insert it into the opening. Press from the top to click it firmly into place. You can then lower the access cover and resume printing. 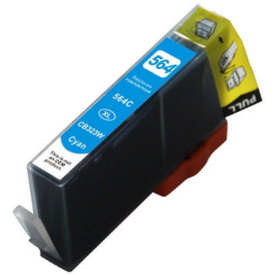 The 564XL Cyan cartridge works with a large number of HP models. This includes small office models like the Deskjet 3070 and OfficeJet 6410 series. It can also be used with the Photosmart 5510 series, the 6510 series, and the B209 series. The cartridge is also compatible with the C309 series, and photo-centric models like the D5445. For a complete list of 564XL Cyan compatible printers, see the “Fits Printer Models” tab.